With all the death and destruction that intense storms and massive flooding visited on Texas and Oklahoma this week, a new research report by the nonprofit Climate Central is especially sobering. Consistent with climate scientists’ projections for a warming atmosphere due to heat-trapping pollution, the organization’s researchers found that the heaviest downpours have been occurring more often since 1950 in 40 of the 48 contiguous states, including Texas and Oklahoma. Record-breaking rain across Texas and Oklahoma this week caused widespread flooding, the likes of which the region has rarely, if ever, seen. For seven locations there [including Houston], May 2015 has seen the most rain of any month ever recorded, with five days to go and the rain still coming. While rainfall in the region is consistent with the emerging El Niño, the unprecedented amounts suggest a possible climate change signal, where a warming atmosphere becomes more saturated with water vapor and capable of previously unimagined downpours. Across most of the country, the heaviest downpours are happening more frequently, delivering a deluge in place of what would have been routine heavy rain. Climate Central’s new analysis of 65 years of rainfall records at thousands of stations nationwide found that 40 of the lower 48 states have seen an overall increase in heavy downpours since 1950. The biggest increases are in the Northeast and Midwest, which in the past decade, have seen 31 and 16 percent more heavy downpours compared to the 1950s. Extreme heavy downpours are consistent with what climate scientists expect in a warming world. With hotter temperatures, more water evaporates off the oceans, and the atmosphere can hold more moisture. Research shows that the amount of water vapor in the atmosphere has already increased. 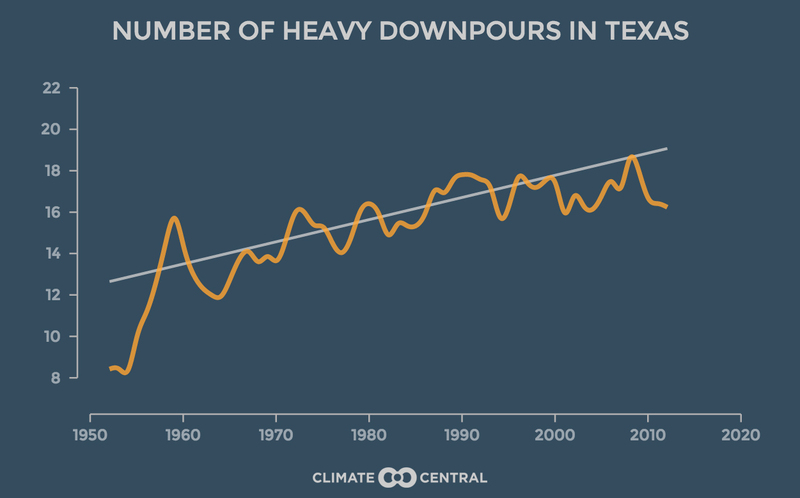 Of the 50 cities with the biggest increases in heavy downpours from 1950-59 to 2005-14, four were in Texas, according to the Climate Central research. With their ranking on that list and percentage increase, they were McAllen (No. 1, 700 percent), Houston (No. 8, 167 percent), Austin (No. 31, 67 percent) and El Paso (No. 47, 40 percent). Climate Central’s findings were also in line with last year’s National Climate Assessment, a sweeping summary of the impacts of climate change across the U.S., assembled by a team of more than 300 experts from across the country and guided by a 60-member Federal Advisory Committee and reviewed by other experts including a panel of the National Academy of Sciences. Changing extremes in precipitation are projected across all seasons, including higher likelihoods of both increasing heavy rain and snow events and more intense droughts. Winter and spring precipitation and very heavy precipitation events are both projected to increase in the northern portions of the area, leading to increased runoff and flooding that will reduce water quality and erode soils. Increased snowfall, rapid spring warming, and intense rainfall can combine to produce devastating floods, as is already common along the Red River of the North. More intense rains will also contribute to urban flooding. One of the most important reasons we care about climate change is because it exacerbates the risks we already face today. Texas is home to many of the fastest growing metro areas in the U.S. This rapid urbanization and development changes the face of the land, increasing flood risk at a time when, at least for the eastern half of the state, the risk of heavy downpours is also on the rise. On Monday night the heavens opened over Houston, dousing the city with some of its heaviest rains since the near biblical floods of Tropical Storm Allison. While forecasters predicted a wet Memorial Day weekend, no one expected as much as one foot of rain to fall during a single night, nor the ensuing mayhem caused by widespread flooding. So what caused these intense storms to regenerate, and dump 162 billion gallons of water on Harris County? There’s only one answer, the Gulf of Mexico. It provided the additional fuel for storms that, had water been collected across the county, could have filled the Astrodome more than 500 times. John Nielsen-Gammon and Katharine Hayhoe are members of the TCN Advisory Board.